How do I record laps during a workout? You can record laps during your workout either automatically or manually. At the Measurement screen, press the Enter button to begin recording a lap manually. To record laps automatically, select AT Lap from the Settings screen and select a preset. 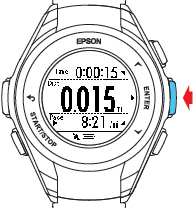 When your workout reaches the time or distance defined by that preset, your watch automatically begins recording laps. You can configure the AT Lap presets in the Workout Settings menu in the Epson View app. When your watch records a lap, it displays the Lap screen for a few seconds. 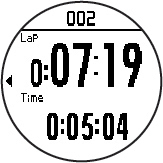 The Lap screen displays the lap number, lap time, and time for the current lap.